Ronaldo Renee struck a mature fifty as Demerara placed themselves in the driver’s seat heading into the final day against the U17 Select in round one of the Guyana Cricket Board U19 three-day inter-county tourney. Played at Wales, Demerara who resumed on 25 for 1 took their first innings total to 190 all out after wicket-keeper Renee, cracked some 11 fours in his top knock of 67. Ramnarine Chatura batting down the order crafted an unbeaten on 40 with three fours and a six while all-rounder Ronaldo AliMohammed chipped in with 23. Needing 100 to avoid an innings defeat, the U17 who were knocked over for 90 in the opening day, were 58 for 3 at stumps batting a second time with night watchman Anthony Antonio and Kevin Sinclair at the wicket. 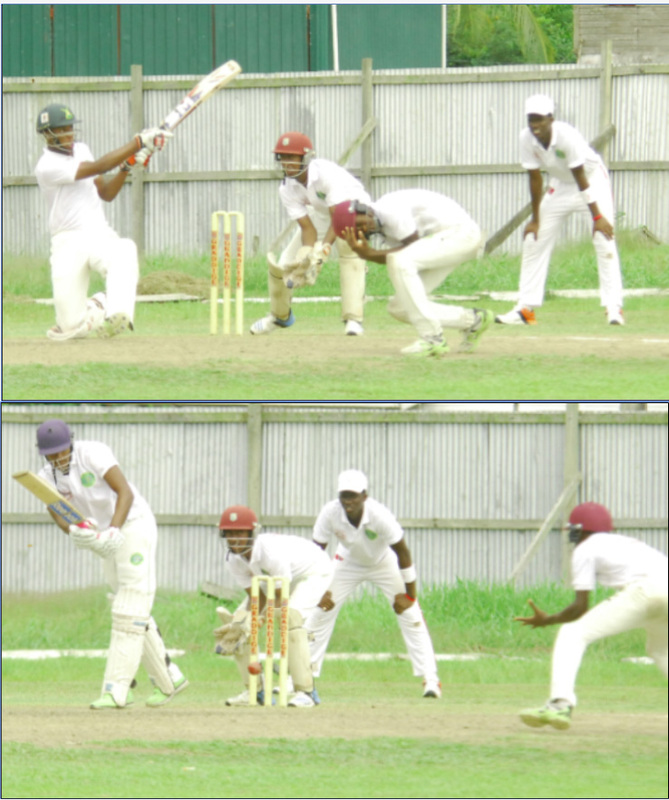 Action between Demerara and the U17 Select during day two of the GCB U19 3-day inter-county first-round match at Wales. The second innings for the U17 side was a bit more fruitful than that of their first innings where they were bamboozled by the Demerara bowlers who made light work of their junior counterparts. Openers Javed Karim and Bhaskar Yadram, who was the top scorer in the first innings with 18, were keen to take the fight to the opposition and played a few good strokes before departing for 15 and 16 respectively. Glove-man Joshua Persaud (00) failed for the second time in the match while Antonio and Sinclair steadied the ship towards the close of play and will look to resume their innings in a more positive fashion today. When play began earlier in the day, Renee who had hogged the lion’s share of the overnight score resumed on 23 and knuckled down as Demerara sought to build on the pressure they had applied on the first day. Renee was aggressive but responsible on a typically difficult batting surface which was not helped by the overcast conditions. He managed to take his score into the 40’s easily and quickly got to his half century. At 50 for 2 and with lunch approaching, meagre contributions came from skipper Travis Persaud who scored 12 and Malcom Hubbard who chipped in with 11 as Demerara looked to clear their deficit. When left-arm spinner Ashmead Nedd (3-51) and Yadram (2-6) stopped the scoring, it was AliMohammed who took the fight to the U17 bowlers before their innings came to an end after tea. Action in the third and final day bowls off at 9:30hrs.